We’ve been following and covering Toronto animator Carla Veldman‘s work for some time. She’s produced a couple of great films(Dog Walker, the Scarf), and is in production on another: Uncle Antlers. This time around she’s raising some money via Indiegogo. 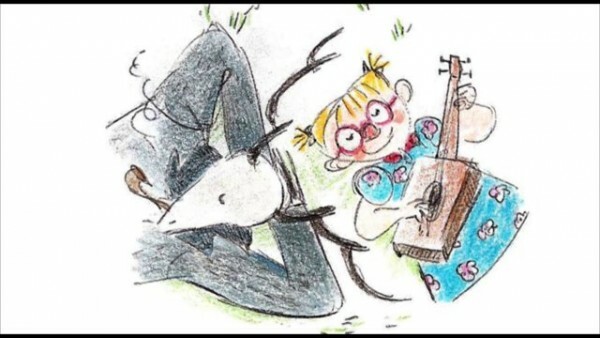 Uncle Antlers is a 5-minute film traditionally animated on paper via pen and pencil crayon. With a dollop of Magic Realism and a dash of whimsy, the film follows the friendship between a young girl and her imaginary companion and the ways it changes over time. Three-and-a-half minutes have been animated so far with the aid of the Toronto and Ontario Arts Councils grants, the latter grant being contingent upon meeting the budget. I’m looking to raise the rest of the funds via this campaign so that I can continue dedicating my full attention to the film and complete it by Autumn 2015. I like what Carla does. I’ll be supporting. If you can’t, then please share. Best of luck to Carla and Uncle Antlers! This entry was posted on Tuesday, March 3rd, 2015 at 12:09 pm	and is filed under News. You can follow any responses to this entry through the RSS 2.0 feed. It’s probably a good idea to put an actual link to the fundraiser in the article don’t you think?